Bangkok is Thailand’s capital and largest city. 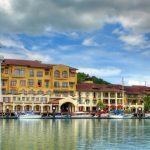 This place is not only famous for the most shopping paradises but visitors also admire the splendid beauty of the golden temples, the royal palace, and many other attractions. If you have to name one of the attractions that can not be missed in Bangkok, the No. 1 candidate must be the Grand Palace. 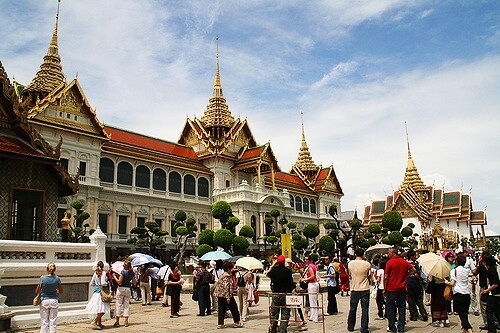 Visiting the Grand Palace, tourists will understand the reasons why it is not by accident that people refer Thailand to another name which is “Golden Temple Country”. The Grand Palace, located on the Nam River, is one of the most famous tourist sites preserved in Thailand. 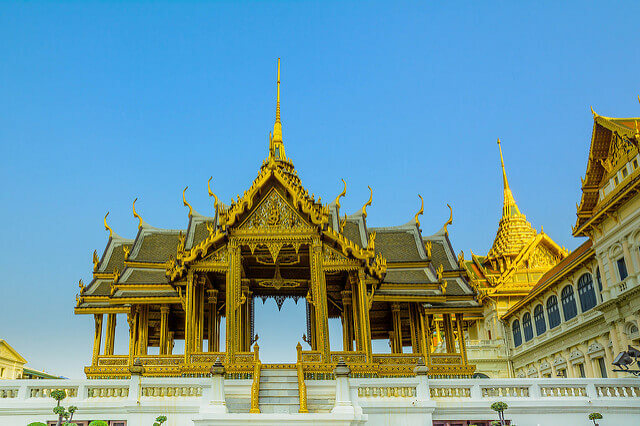 Built in 1782, a 150-year residence for Thai royal families named “the Grand Palace” is an ancient architecture with a creative and ingenious design of Thais people. Visitors come to the golden temple to admire the cultural essence, local architecture or even to immerse themselves in a virtual world of pure magic and tranquility. If you are planning to take a Thailand tour to Grand Place, please refer to the information below of Grand Place Bangkok entrance fee to make your trip even better! 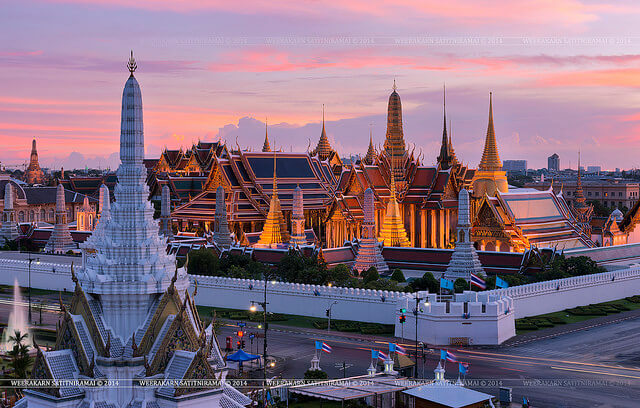 The Royal Palace in Bangkok (the Grand Palace) is a complex of adjacent relics including The Royal Palace, the Royal Reception Halls, and temples. The works here are inlaid with 24 karat gold leaf in the temple towers creating glamorous, sparkling settings. The first destination in Grand Place that Grand Place Bangkok entrance fee suggests is The Royal Palace – a typical example of combining traditional Thai architecture with western style. The Royal Palace is located in much the same way as Siam’s ancient Ayutthaya. The Jade Buddha Temple is located in the corner of this outside area. Only 2 parts of the central area are opened to the public. Come here to visit; you will be impressed by the sophisticated architecture, magnificence, and splendor of the palace. The largest tower of the architectural community here is called Phra Sri Rattana. The tower is like a mountain-shaped mansion surrounded by millions of thin gold leaves transferred from Italy. Another majestic tower next to Phra Sri Rattana Tower is the Phra Mondop Library which preserves the entire typical Thailand Buddhist scriptures with a curved roof and sharp peak. Inside the palace is where the king’s wife and daughter lived. Although this area is currently uninhabited, it is still not opened for the public visiting. 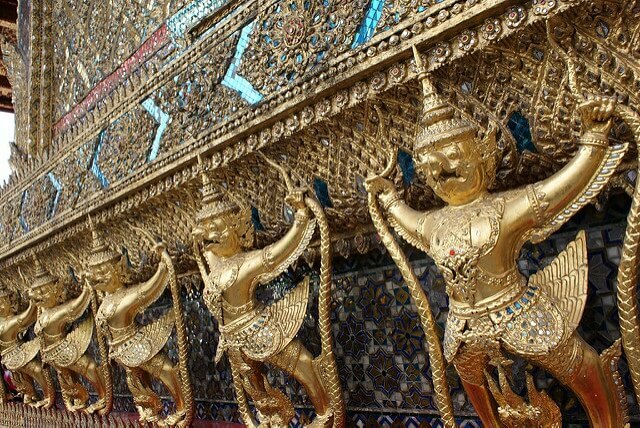 Although being built in an architectural complex, the Grand Palace and Wat Phra Kaew have two distinctive design styles of Thais architecture in combination with European style. The Royal Reception Halls is the second destination in Grand Place with impressive architecture and magnificence. Today, this place is used as the venue for important events of the country. Besides, you can also visit the Dusit Hall, which is considered to be the most beautiful architecture museum. It provides more information about the restoration of the Palace and the Buddha statues. 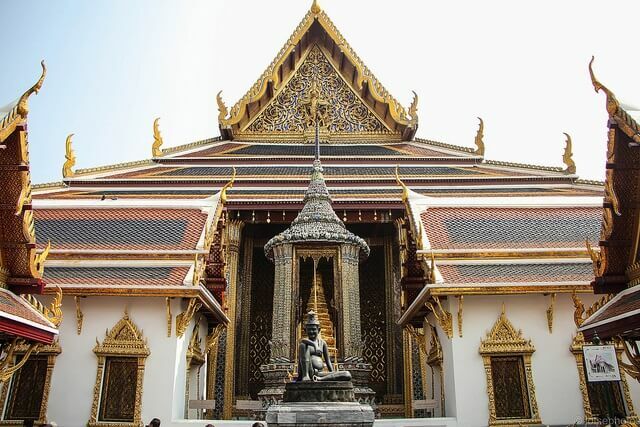 Wat Phra Kaew (officially named Sri Rattana Satsadaram), also known as a Temple of the Emerald Buddha is considered to be the most important Buddhist temple in Thailand. 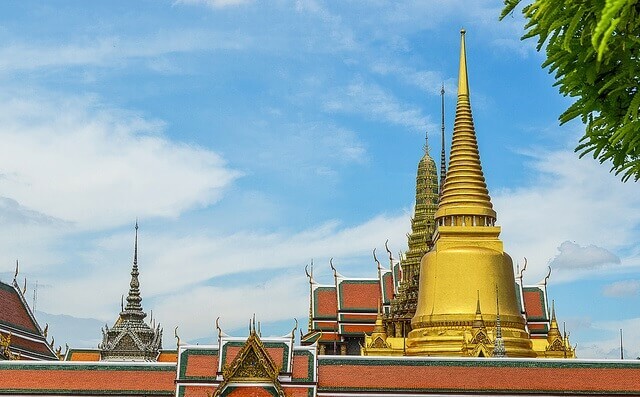 Located in the historic center of Bangkok, within the Royal Palace area, Phra Kaew Morakot (the Emerald Buddha) is a home to a statue of the goddess who carved elaborate works on a solid jade. The beautifully decorated Jade Buddha Temple brings a sense of peace and harmony when looking at it. Unlike other temples, this is not the place for monks. The main building is Ubosot (Ordination Hall), which houses a jade Buddha statue. Despite its small size, it is an important symbol of Thai people. This temple is the last place in the journey of visiting the Grand Place that it certainly will not disappoint you. To provide tourists with a convenient tour, we give you some notes when visiting temples in Thailand. 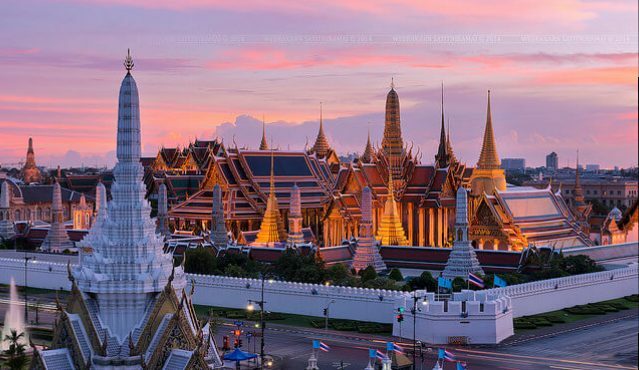 Notably, the Grand Palace and the Jade Buddha Temple are the most sacred places in Thailand. In here you will not wear short skirts. Visitors must wear proper clothing before visiting the temple. Men must wear trousers, sleeveless shirts (not tricot). Women also dress similar and have a casual style, do not wear thin clothes or anything can show your shoulders. Especially, tourists are not allowed to smoke or go on barefoot. If you wear sandals or flip flops, you must wear socks when entering the Grand Palace. Near the entrance, there is a clothing hire service for proper clothes in agreement with regulations that requires visitors to deposit money in advance. Therefore, you do not need to worry too much about missing out on the wrong clothes and do not forget to bring your passport when traveling here. 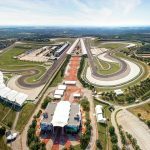 Domestic and foreign visitors must purchase tickets. Thai guides are required to buy a separate card. 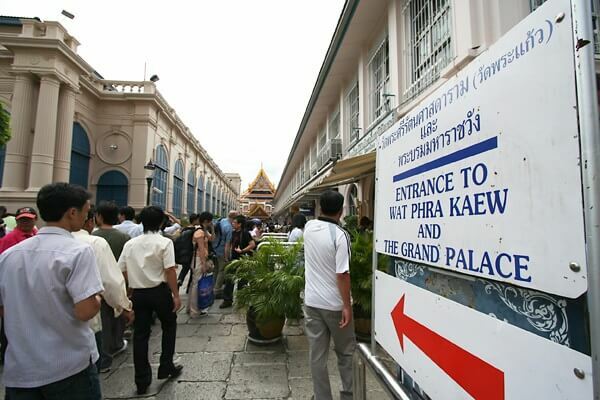 The Grand Palace is opened daily from 8.30am to 3.30pm. Tickets are available for 500 baht, including the Vimanmek Palace and Dusit Abhisek Hall. Wat Phra Kaew closes early at around 15:30 so the Grand Place Bangkok entrance fee recommends you to visit the temple first and do not come too late. Tourists can hire tour guides from 10:00 to 14:00 or personal audio guides (available in English, French, German, Japanese, Chinese, Russian, and Spanish) when visiting the Wat Phra Kaew Temple. This area is selling tickets for visitors at the price of 400 Baht for each. 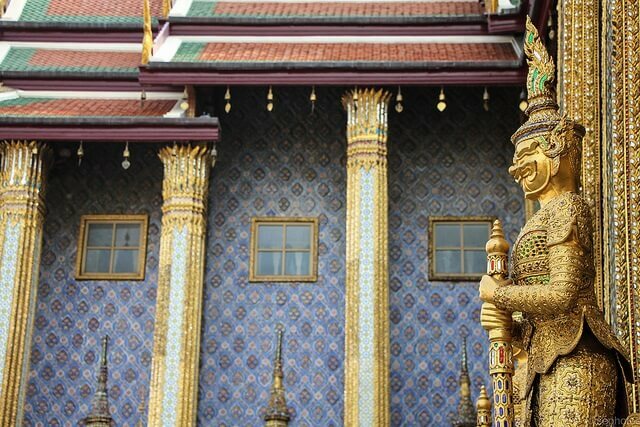 The trip to Bangkok will be hard to be completed without a magnificent and beautiful place: “The Grand Palace”. It is a popular tourist destination in the world. Thai royal palaces continue to attract many tourists because of the beauty of architecture and the complexity of details. That is considered a pride of the skills and creativity that Thai people have achieved. Therefore, there is also very strict protection at the main gate. 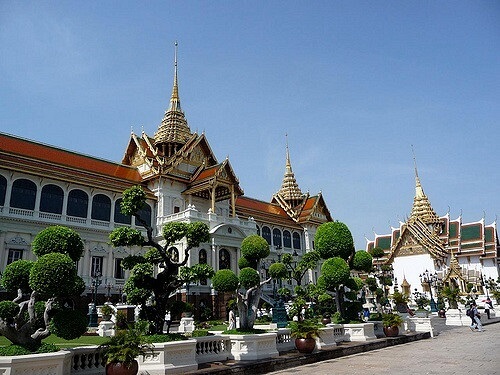 It doesn’t sound right to say that you have visited Thailand without entering the Royal Palace. Refer to the article of the Grand Place Bangkok entrance fee for a full trip with your lover and family!